Today’s Flash Back Friday comes from Episode 141, originally published in April 2013. 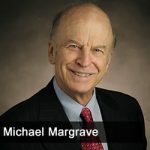 Michael W. Margrave has been a practicing attorney in Arizona since 1968. Mr. Margrave graduated from Texas A&M University in 1963 and received his Masters Degree in accounting and Law Degree from the University of Arizona in 1965 and 1968, respectively. Mr. Margrave is also licensed as a Certified Public Accountant, has served as Honorary Consul of the Republic of the Ivory Coast and was the original attorney and Secretary for America West Airlines, Inc. Mr. Margrave concentrates in company law, business acquisition and disposition transactions, real estate law and estate planning. Positions Held: Republic of the Ivory Coast, Honorary Counsel America West Airlines, Inc., Attorney and Secretary. Michael Margrave is partner in a Scottsdale Law firm, Margrave-Celmins, specializing in business law and estate planning. Michael is a gun enthusiast who is working with contacts at the ATF to add a special kind of Trust to his law practice – The Gun Trust. Michael wants to help fellow gun owners, especially those who would inherit guns from a relative, avoid mistakes that could land them behind bars in this post-Newtown, CT world of panicked firearms buying and draconian gun laws.